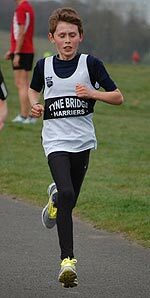 Running in his Tyne Bridge Harriers colours, Leodhais came 4th out of approx 100 children. The XC Course race was approx 1 mile and Leodhais was running in the leading pack of four, the winner only finishing 20 feet ahead. .. keep up the brilliant running. What a performance little Mac! Were all very proud of you Leodhais and who knows what your likely to achieve in the future. If its the same competition I done when i was a young whipper snapper, you will now run for North Tyneside ???? Wow! That’s brilliant news. Congratulations to Leodhais. Its also good to hear that there about 100 youngsters running. The future may be bright!